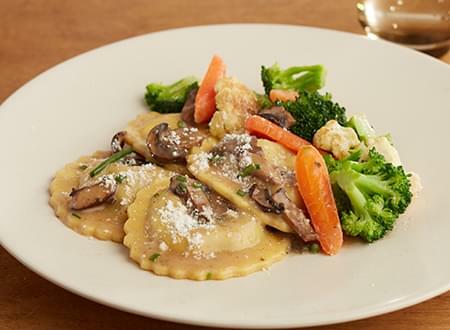 Jumbo ravioli stuffed with cremini and portobella mushrooms and topped with a sauteed mushroom marsala wine sauce. Starch selection will NOT be supplied, since entree fills the entire tray other than vegetable. MUSHROOM RAVIOLI, CHICKEN BASE, MARSALA WINE, THYME, SHALLOTS ULTRA SPERCE MAIZE, SUNFLOWER OIL, BLACK PEPPER.